Fickle Feline: The Language of Music. Today was a good day. It's important to say that out loud and to say thank you when these days come around. Today was a good day. Max had a terrific Occupational Therapy session at Blue Balloon with his therapist Jess, and then followed it up with a Music & Speech Therapy session that made me smile all day. 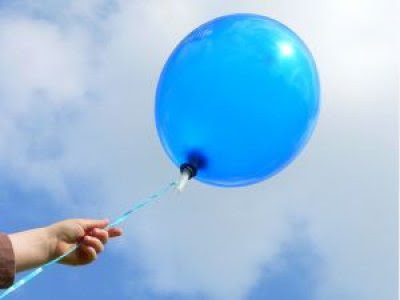 What I love about Blue Balloon is that Max's team takes such joy in his progress, and is fantastic about sharing his wins with eachother, so that they can all continue to build on his new skills. I truly believe that this is why Max is progressing at such a rapid pace. This is why our Max is starting to emerge - we are finally getting to meet our little boy. I thought I would pass along the positive results of the joint SLP/MT session that Irene and I had with Max today. Every week we are seeing and hearing a greater degree of positive results. Today we witnessed a sharp increase in Max’s ability to follow directions. For example, when asked to help clean up Max placed all the farm animals back in the basket. Even during new musical experiences such as “Rolling the Ball to a Friend” Max quickly picked up the motor planning involved and was soon independently rolling the ball to Irene and mom! Using the word “push” to cue max during this activity seemed to really help coordinate the physical actions involved. the instrument, the therapy team pared these actions with the word “push.” Soon Max was almost independently pushing the cymbals together! In terms of his socialization skills Max continues to make progress. During the Good-bye song he imitated a wave. Max also held sustained eye contact on several occasions during the session. I am personally really pleased that Max is progressing so quickly. We will strive to keep everyone informed as Max continues treatment. I think it would be good if we could all continue to provide updates as they come available to his entire treatment team. How can this kid fail with a team like this behind him? Go Team Maxwell indeed! So happy for you all! Go Max!! Wonderful news!!! Way to go, Max! !